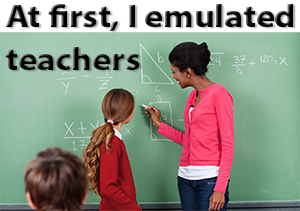 When I first began teaching, I mostly emulated my high school and college teachers. While this was great for teaching information, facts, theology, etc., it was less effective at transforming lives. As I searched for more effective teaching techniques, I found that most books and seminars focused on teaching information. 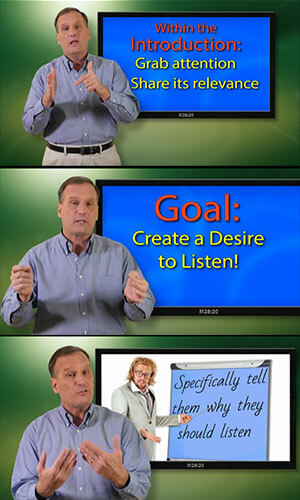 Even so, over the years, I discovered better ways of teaching transformational, rather than informational, lessons. This series condenses 27 years of books, seminars, experience, a Master of Divinity, and a Ph.D. into a simple, practical, step-by-step, transformational, teaching format. In the books and DVDs, you will learn how to create a Sticky Proverb that helps your listeners stay focused on your lesson's main point and then how to apply it to their lives on a daily basis. 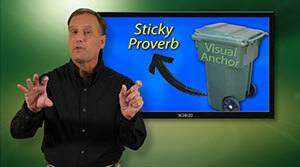 You will also discover how a Sticky Proverb helps you narrow your lesson’s exact direction, angle, and focus. For example, if you were teaching on love in 1 Corinthians 13, you could teach all day, but when you only have thirty to forty minutes, you have to figure out what to include and what to save for another day. 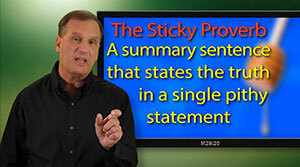 The process of creating a Sticky Proverb helps you narrow your topic by clarifying your exact target. You'll also learn how to create a Visual Anchor and connect it to your Sticky Proverb so your class can remember it for a lifetime. 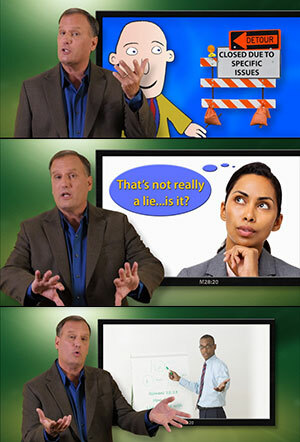 Visual Anchors are like mental anchors that help listeners remember truths by connecting or linking them to a visual concrete image, object, story, illustration, analogy, example, metaphor, testimony, or real-life situation. One pitfall the Sticky Proverb helps you avoid is what I call Ramblemation. I define it this way, "the act of wandering or meandering through the text giving various definitions, explanations, and background information loosely related to various points but not specifically related to any particular central point." Instead of including all you learned, you have to learn what to include. Introductory Sale includes 10 FREE books! 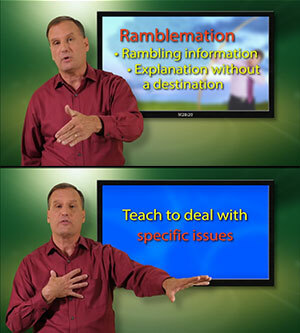 Ramblemation often leads to a Teach-And-Tip lesson format where the teacher explains a verse or two, gives a quick application tip, then moves on to the next couple of verses followed by another application tip. This process continues until he reaches the end of the hour or the end of the passage. On the one hand, it's great that application tips are included; however, they usually have a minimal impact because they aren't working together to explain, prove, illustrate, and integrate a specific central point into the listener’s life. Contrary to popular belief, the goal of your lesson's introduction is NOT to introduce the topic, passage, or lesson. Rather, the primary goal of the Introduction is to captivate your audience’s attention and create within them a tremendous desire to listen to the lesson. If your introduction motivates everyone to stop eating their donut and drinking their coffee in anticipation of what you are about to say next, then it has done its job and you are ready to move on. First, tell them why they should listen, then you have the rest of the lesson to tell them about the topic that now has their attention. One of the main reasons people understand your lesson but don't apply it relates to Roadblocks. Even though they understand the truth, they don't always believe it, accept it, value it, commit to it, and make it a priority in their life. It's not that they're rejecting the truth, but some challenge, painful experience, justification, rationalization, or objection is blocking it and preventing it from moving from their cognitive understanding of it, to their heart. So, to create doers of the Word and not hearers only, you will learn how to help your class move past these various roadblocks within their life. • You should live by faith. • You need to walk in the Spirit. • You ought to be depending on God. • You should be praying without ceasing by this point in your life. but don't know how to. Your lesson's Conclusion is also very important since it is where you (1) summarize the main truths, (2) summarize how the truths can be applied, and then most importantly, (3) challenge everyone to apply them. You will learn how to create effective conclusions that encourage everyone to take the next step, give challenges that are doable or attainable, ask people to commit for a reasonable length of time, include a start and stop time, aren't cliché challenges, and the like. Excellent book. I used a good bit of this information in a Sunday School Director's workshop! Such good information - every church should have this book in their library for teachers, leaders, directors, etc. to glean from! Immensely practical! 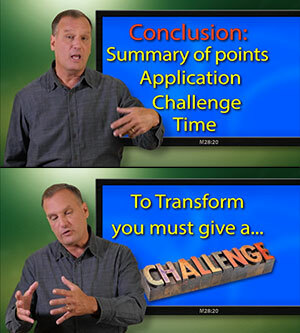 I used book 1 and 2 for a Grad Level Teaching the Bible course I taught at Oral Roberts University. I had the students make PowerPoint presentations based upon these texts which they could later use for teacher training in ministry. Great material, Dr. Simon! The books include good application exercises as well. These books have been a big help to me in the training of Sunday School and Bible club teachers in the Dominican Republic where I am a missionary. I love the books! I told my Sunday school director, who found the books, "I think you've got something here." These are making me rethink some things. As I was reading the book, it was so funny, because I was saying to myself, "Come on...bring it on. I may be doing some of that Ramlemation you're talking about. We've got to stay on our toes." As I talked with my director, I said, "Do we want to give everyone an outline when they watch the DVD?" but she said, "We can, but I don't want to give a lot of detail because I want them to read that book!" and I said, "I got ya." Book 1 presents several easy-to-understand, practical principles to create transformational lessons. 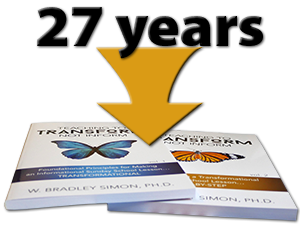 Book 2 shows you exactly how to integrate seven of the most important transformational teaching elements into your lessons. Book 1 gives the foundational principles, then book 2 gives additional principles and shows you how to integrate it all together in a step-by-step fashion. The entire series works together. 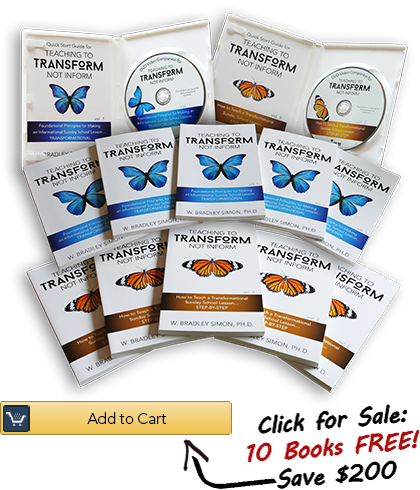 If you want to lead your teachers through the series, then the corresponding DVDs are a huge asset. Dr. Simon presents the content chapter-by-chapter using multimedia, animation, photos, music, and more and even includes questions for group discussion. The DVDs do all the work for you so anyone can facilitate the training sessions. If they can ask the questions, they can lead the training! 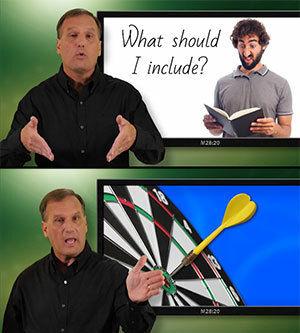 In addition to the five video sessions in DVD 1 and the seven sessions in DVD 2, they include a Leader’s Quick Start Guide, and a digital Promotion Kit. The first seminar went great, but around 8 people couldn't make it, so we're offering the seminar again this Saturday. We had enough books left over for those eight, but now we have 18 who signed up for it! Evidently, the word got out and many more have decided to take it. We are going to need you to rush us 10 additional books please. I've known for years that "just teaching truth" was not enough. 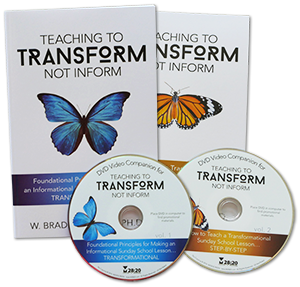 But it was not until I read the Teaching To Transform Not Inform series that I was able to help teachers understand how critical it was. This two book series is Biblical, practical, and understandable. It now is the foundation of our teacher development ministry at our church. You don't need to get back to me. I just wanted to let you know how your material continues to impact the teachers in our church. I first took 12 teachers through the 2 books. 9 months later we had a refresher session where the teachers enthusiastically shared the ways their teaching has been improved. Other teachers in the church contacted me to find out about "the books" they have heard about. And I'm currently preparing to teach and — yet again — pulling out your books to re-read sections as I wrestle with "the connection" for this lesson! I recently read an article on how Steve Jobs was an amazing "presenter" and found it amusing how many of his "strengths" matched points in the books. Good communication is good communication. Glad we are communicating something so much more significant than the fine points of an iPhone!! • The DVDs include graphics, animation, audio, illustrations, etc. 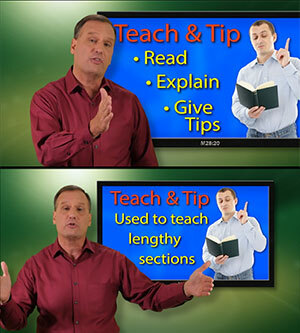 • Flexible scheduling: show one lesson a week, all at once, half now and half later, etc. I am so looking forward to your second DVD. I have read thro both books and listened to DVD 01 twice now. Thank you for all your work in putting these materials together. I have always loved teaching Sunday School. You brought so much clarity on how to teach for eternity. 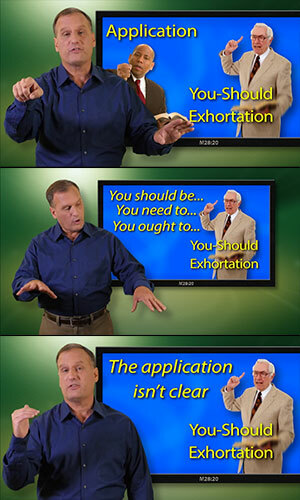 I am so looking forward to where all of this will take our Christian Ed. Over the last several years, we have attempted to be a Transformational Sunday School rather than just a general Sunday School of fellowship and information. 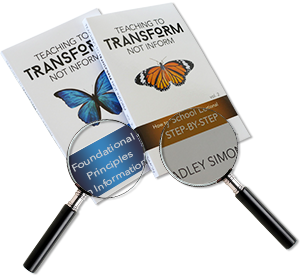 Last October, we trained our teachers from the Teaching To Transform Not Inform Book #1. The sessions were great. We are looking forward this October to train with book #2. We already see our teachers and potential teachers, all geared up for another great study. Your Books have been a blessing to us. Great Book! We used this book in our Sunday Bible School Conference last year. It contains a wealth of information for Bible Teachers.